After a long, dark winter, spring’s bright sun and warm winds are, well, a breath of fresh air. The only downside? All that sunshine spotlights your leaf-filled gutters, cracked sidewalks and the dead plants in last year’s flower beds. Here are 10 Helpful Spring Home Maintenance Tips to assist you in preparing for the season ahead. • Check for loose or leaky gutters. Improper drainage can lead to water in the basement or crawl space. Make sure downspouts drain away from the foundation and are clear and free of debris. • Low areas in the yard or next to the foundation should be filled with compacted soil. Spring rains can cause yard flooding, which can lead to foundation flooding and damage. Also, when water pools in these low areas in summer, it creates a breeding ground for insects. • Use a screwdriver to probe the wood trim around windows, doors, railings and decks. Make repairs now before the spring rains do more damage to the exposed wood. • From the ground, examine roof shingles to see if any were lost or damaged during winter. If your home has an older roof covering, you may want to start a budget for replacement. The summer sun can really damage roof shingles. Shingles that are cracked, buckled or loose or are missing granules need to be replaced. Flashing around plumbing vents, skylights and chimneys need to be checked and repaired by a qualified roofer. • Examine the exterior of the chimney for signs of damage. Have the flue cleaned and inspected by a certified chimney sweep. • Inspect concrete slabs for signs of cracks or movement. All exterior slabs except pool decks should drain away from the home’s foundation. Fill cracks with a concrete crack filler or silicone caulk. When weather permits, power-wash and then seal the concrete. • Remove firewood stored near the home. Firewood should be stored at least 18 inches off the ground at least 2 feet from the structure. • Check outside hose faucets for freeze damage. Turn the water on and place your thumb or finger over the opening. If you can stop the flow of water, it is likely the pipe inside the home is damaged and will need to be replaced. While you’re at it, check the garden hose for dry rot. • Have a qualified heating and cooling contractor clean and service the outside unit of the air conditioning system. Clean coils operate more efficiently, and an annual service call will keep the system working at peak performance levels. Change interior filters on a regular basis. • Check your gas and battery-powered lawn equipment to make sure it is ready for summer use. Clean equipment and sharp cutting blades will make yardwork easier. Special thanks to: Dwight Barnett, a certified master inspector with the American Society of Home Inspectors; who initially shared this checklist on HGTV’s website to help you target the areas that need maintenance so you can get your chores done quickly, leaving you time to go outside and play in the sunshine. With the changing of the seasons you are more likely to find animals trying to nest indoors; MadCity Environmental will remove & remedy pests from your property during any time of the year. 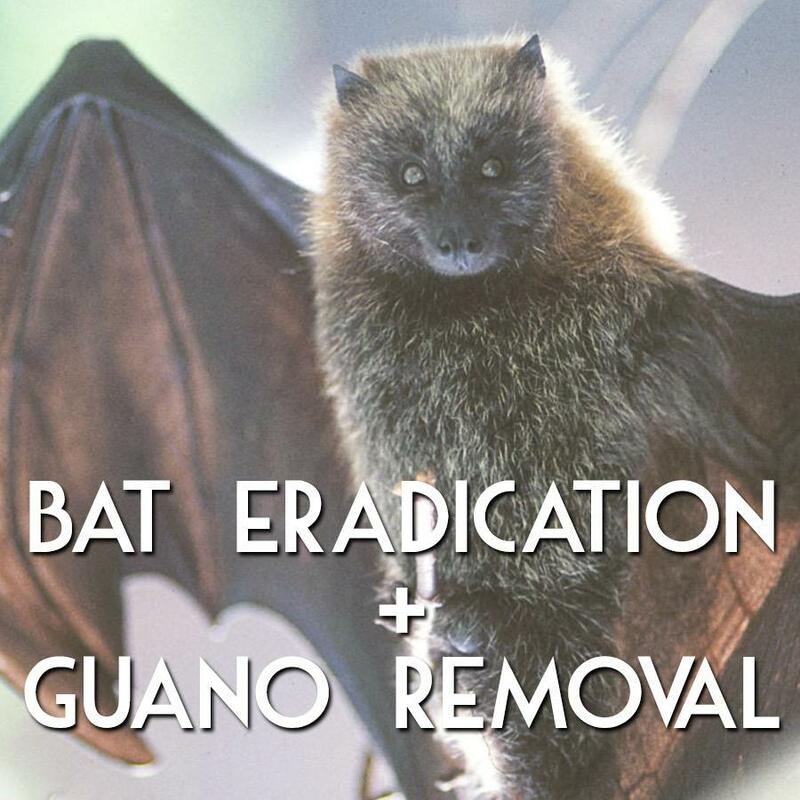 Equipped with multiple solutions to remove bats & the remaining guano (poop!) from your home or property. Post-removal remediation; providing location specific maintenance to discourage return. What does bat guano look like? Bat droppings, known as guano, are small and dark in coloration. The elongated pellets are crumbly and turn to dust when touched. Often used as fertilizer because of its high nitrogen and phosphorus content, guano can be dangerous when allowed to accumulate in the home. The nutrient-rich droppings cultivate the growth of histoplasmosis fungus, which causes severe respiratory problems in humans. Deposits of guano accumulate within walls and attics as well as on the ground and roof tiles. The musty, acrid smell of bat droppings, along with the stains they leave on walls or ceilings, is a sure sign of bat infestations. Due to the hazardous nature of the droppings and the fact that bats are common carriers of the rabies virus, property owners should never attempt to remove bat infestations or clean guano deposits on their own. While bats are beneficial creatures overall, they do pose certain health threats. Diseases like rabies and histoplasmosis are often associated with bats. Though 99 percent of rabies-related deaths are caused by rabid dogs, bats are still carriers of the disease. Thankfully, even rabid bats refrain from biting humans unless they feel threatened in some way. While the fungus that causes histoplasmosis is not carried by bats, it lives in warm, humid soil. Bat droppings act as a catalyst for the development of the fungus, and human infection occurs when people inhale the spores. Bats also host ectoparasites, like fleas, flies, ticks, and mites, that endanger the health of humans and pets. Finally, bat urine can cause a pervasive and unpleasant smell, while bat droppings stain ceilings and building visages. Since bat populations can prove beneficial, some homeowners construct what are known as bat houses close to gardens and around homes in order to keep bats from roosting where they are unwanted. Since bats will likely still target any available structure, homes remain susceptible unless individuals take the time to seal off potential points of entry. In addition to sealing cracks and openings, illuminating attic spaces and eaves during nighttime hours helps deter bats from roosting, as does placing fans in attics to lower the temperature. Homeowners must be careful with any attempt to exclude bats by sealing their entry points. While this can prevent colonies from coming back later, trapping an adult or baby bat indoors may force the animal to escape into living spaces or lead to its death. Trapping and removal of a bat can be tricky and should never be attempted if the bat was found in a room where people were sleeping. Calling your local Critter Control certified wildlife professional to manage the procedure is the best way to ensure safety. While at your property, Critter Control will identify the entry points bats are using to access your home and make recommendations to exclude them permanently. Bats suspected of having rabies should always be left for professionals to remove. PROPER INSULATION + ADEQUATE VENTILATION IS KEY! 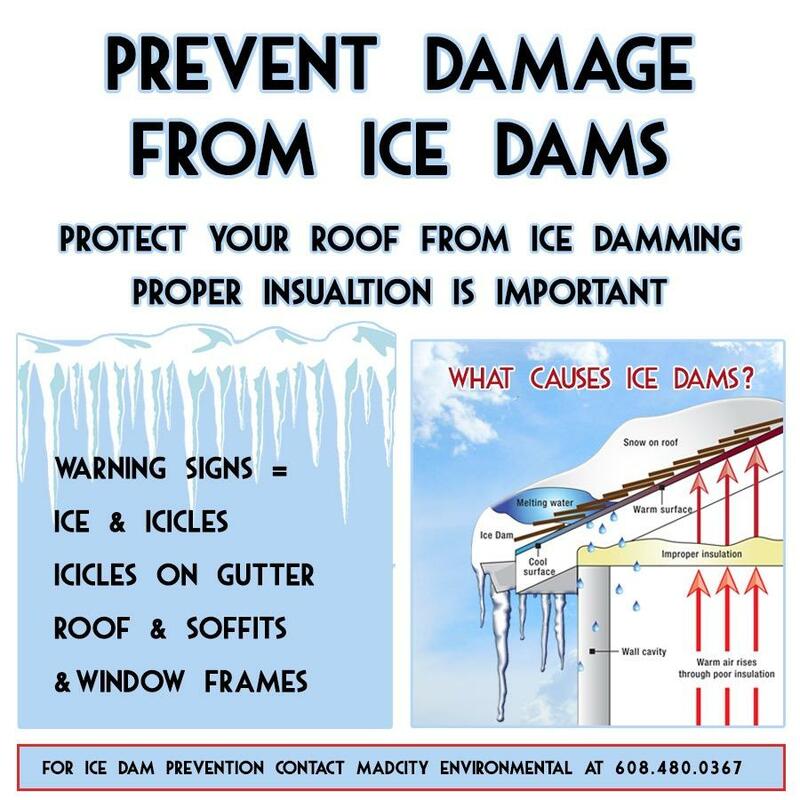 Contact MadCity Environmental today for more information on how to ensure your home has proper insulation and adequate ventilation to avoid multiple harmful house moisture issues. Finding solutions to moisture problems, be they condensation or water problems, is often a difficult, time-consuming and expensive undertaking. The first step in any situation is to identify the source of the problem. This may not be easy because two and often more things may be working together to create the problem. Sometimes as people attempt keep out the cold, while keeping in the warmth, many homeowners caulk and weatherstrip around windows and doors. Unfortunately, if not done correctly and/or without proper ventilation, these methods can have a negative effect as the same practices that trap heat in the home can also trap high levels of moisture. 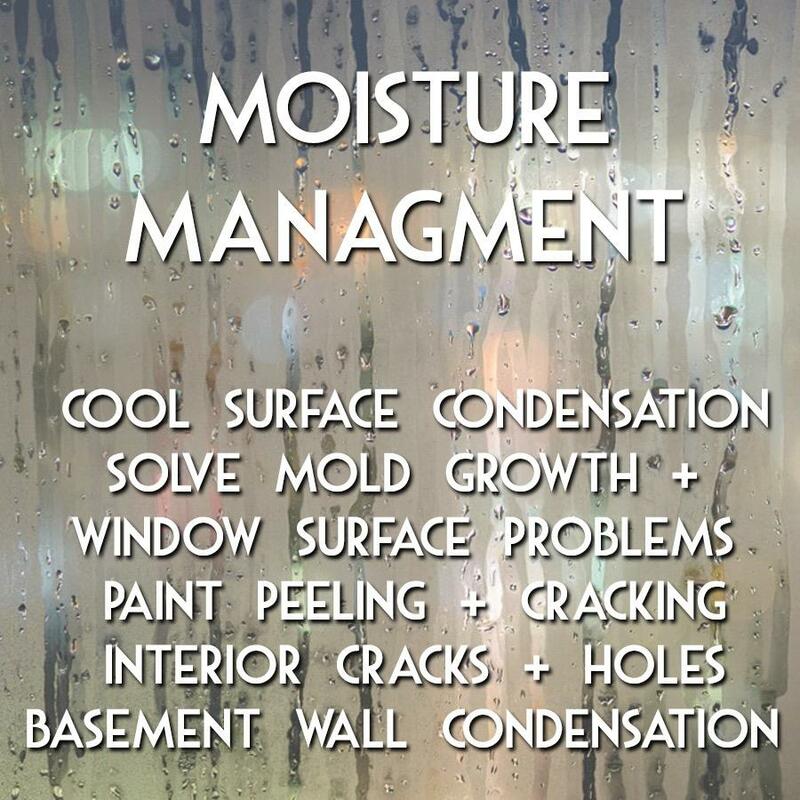 Another common condition contributing to moisture problems in Wisconsin homes is the existence of cool surfaces with which interior moisture vapor naturally comes in contact. These include poorly weatherized and insulated windows and poorly insulated exterior walls and ceilings. In less energy-efficient homes, cool surfaces are readily available for water vapor to condense and collect on. Warming these surfaces by adding insulation or cutting down on the amount of cold air that can get to them by caulking and weatherstripping will lessen condensation problems. Condensation on window surfaces in cool or cold months can be controlled by adding layers of glass in the form of storm windows or using double- or triple- glazed window units, installing a plastic film on the outside or inside of the window frame (a less expensive way to add storm window protection), repairing broken glass, and sealing any leaks in and around the window with weatherstripping and caulking on both the inside and outside. Peeling exterior paint and discolored interior walls and ceilings (usually in the form of mold or mildew growth) are good indications that condensation is occurring inside wall cavities and attics. During winter, cold outside air collects in these areas and can cool attic, ceiling, wall cavity and interior wall surfaces to the point where condensation occurs. Adding insulation to these areas will warm these surfaces and thus help prevent condensation. When you add insulation, be sure to repair, caulk or weatherstrip any holes or cracks in ceilings, walls and floors and along baseboards. These are prime areas for moisture migration to occur. Moisture vapor moves with air, and any cracks or holes that allow air to flow freely through them are potential trouble spots. Adding insulation to basement walls has advantages similar to adding it to wall cavities and the ceiling: it eliminates cold surfaces where condensation can occur, and it cuts energy costs. Contact John at 608.480.0367 – MadCity Environmental – to learn more! Tired of high energy bills, ice dams, high humidity, leaky windows and doors, and peeling paint? Are you ready to lower your energy costs, save money all year long, make your home super comfortable, and have one contractor help you do this? MadCity Environmental provides professional energy-efficient insulation and house/attic improvement services to residential and commercial clients throughout southeastern Wisconsin. We provide a complete home performance analysis, looking at all the factors that contribute to high home energy usage and propose a solution that reduces your energy consumption and improves the comfort inside your house. A home energy audit helps owners determine where their house is losing energy and money – and how such problems can be corrected to make the home more energy efficient. A professional technician can give your home a checkup. Items include checking for leaks, examining insulation, inspecting the furnace and ductwork, performing a blower door test and using an infrared camera. Our service area extends throughout the Greater Madison Metro area. Contact MadCity Environmental to learn more about a professional home energy consultation.